You’ve likely used OneNote before. But perhaps you’ve wondered if there’s more you can do, or if there’s a faster way to do something. 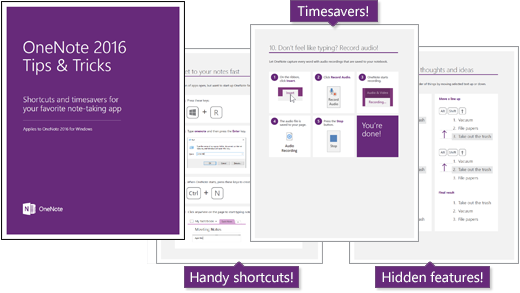 That’s why we created this eBook — so you can learn about our favorite hidden features, techniques, and timesavers in OneNote 2016 for Windows. Microsoft Office 2016 eBooks are a new series of free content. If you found this first title useful, please use the Was this information helpful? section below to let us know. You can also give us ideas for eBooks you’d like to see in the future.